Herb Mix consist of dried dandelion, clover, ribwort, nettle and peppermint. Dried herbs belong to the natural diet of most herbivorous reptiles and acceptance as food is therefore no problem. In addition the dried herbs have a higher amount of crude fibers than fresh food which is beneficial for the digestion. Veterinarians recommend that the amount of crude fibers should be at least 15% which cannot be accomplished with fresh greens only. 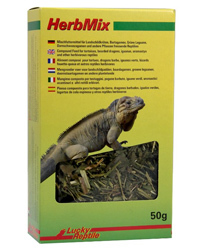 Include Herb Mix in your diet to satisfy the reptiles needs.